Background: Metabolic acid-base disorders in critically ill patients may not be identified by base excess (BE) approach. Anion gap method can detect approximately 1/3 hidden "gap acidosis." In such conditions, when adjusted for hypoalbuminemia, Fencl-Stewart's approach can reliably detect the hidden abnormal anions. Aim: Evaluate the efficacy of simplified Fencl-Stewart equation in identifying the changes in acid-base status of sepsis patients following resuscitation with two different fluids. Settings and Design: Intensive care unit, randomized, prospective, interventional study. Materials and Methods: Three hundred adult patients of both sexes presenting with abdominal sepsis, requiring fluid resuscitation were randomly assigned into normal saline (NS) and Ringer's lactate (RL) group, each comprising of 150 patients. 20 ml/kg of NS or RL were administered over a period of 30 min. The changes in the acid-base status were calculated applying the simplified Fencl-Stewart equation and was compared with the measured values obtained through arterial blood gas. Statistical Methods: Paired t-test for intra-group while unpaired t-test for inter-group comparison. Results: Blood pH and standard BE decreased and the serum Na + and Cl− level increased significantly in NS group. The serum albumin level significantly decreased in both the groups. Sodium chloride effect on BE significantly increased in NS group. Albumin effect on BE significantly increased in both the groups. Unmeasured ion effect on BE did not significantly change in both the groups. Measured standard BE level was significantly less as compared to unmeasured anion effect on BE, in both the groups. Conclusion: Simplified Fencl-Stewart equation is effective in identifying a mixed acid-base disorder, which otherwise would remain undetected. The quantitative acid-base studies of Stewart,  show that three independent variables determine the hydrogen ion and the bicarbonate ion concentration: The strong ion difference (SID), PCO 2 , and the albumin. Fencl and Leith  divided the effect of SID on base excess into sodium and chloride (Na + , Cl− ) effect and albumin effect as well as developed equation to correct the BE for change in Na + , Cl− , and albumin. Several research groups have combined the BE approach with the Stewart approach to acid-base physiology. Balasubramanyan et al. called this approach to base excess as the Fencl-Stewart approach. The metabolic acid-base disturbances can be diagnosed by comparing two commonly used diagnostic approaches, one relying on plasma bicarbonate concentration, and anion gap (AG), and the other on BE. However, the complex and difficult to remember equation given by Fencl and Leith  has been probably the reason for it's under use. Recently, the equation has been simplified by Story et al.,  which is easy to remember and can be used mentally to analyze the acid-base status of patients especially, during ward round. Hence, the aim was to evaluate the efficacy of simplified Fencl-Stewart equation in identifying the changes in acid-base status of sepsis patients following resuscitation with two different fluids. A prospective, randomized, interventional study was conducted in the intensive care unit of a tertiary level hospital. The study was approved by the departmental ethics committee. Three hundred patients of both sexes, age ranging between 20 years and 50 years, presenting with abdominal sepsis, requiring fluid resuscitation were enrolled for the study. Informed consent was obtained from the patient's relative. Patients with co-morbid valvular heart disease, congestive cardiac failure, chronic renal failure and in conditions where liberal fluid resuscitation was contraindicated were not included in the study. The patients were randomly assigned into two groups the normal saline (NS) and the Ringer's lactate (RL) group. Block randomization was carried out so that each group receives equal number of patients (n = 150 patients). Fluid resuscitation was carried out with 20 ml/kg of NS or RL over a period of 30 min and the patients were monitored with multichannel monitor (Excello, seven parameters, BPL make). Blood samples were collected from a separate venous access and radial artery before the fluid administration and immediately after the completion of the fluid administration. The blood samples were coded so as to make the researcher analyzing the samples blind about the time of collections and the groups. The arterial sample was sent for blood gas analysis and the venous sample was sent to assess serum electrolytes and serum albumin levels. The value of serum electrolytes and albumin were applied in the simplified Fencl-Stewart equation of Story et al., to ascertain the acid-base status of the patients both before and after fluid resuscitation. The equations were: (1) Sodium chloride effect (meq/l) on BE = [Na + ] - [Cl− ] - 38, (2) albumin effect (meq/l) on BE = 0.25× 42 - albumin (g/l), (3) unmeasured ion effect (meq/l) on BE = standard base excess (SBE) - sodium chloride effect - albumin effect. The acid-base status evaluated through Fencl-Stewart equation was compared with that obtained through arterial blood gas analysis. Paired t-test was used for intra-group comparisons while unpaired t-test was used for inter group comparison. All through the study, a P of < 0.05 was taken as indicative of statistically significant. Unless otherwise specified, all data are presented as mean ± SD. The demographic data was comparable in both the groups [Table 1]. 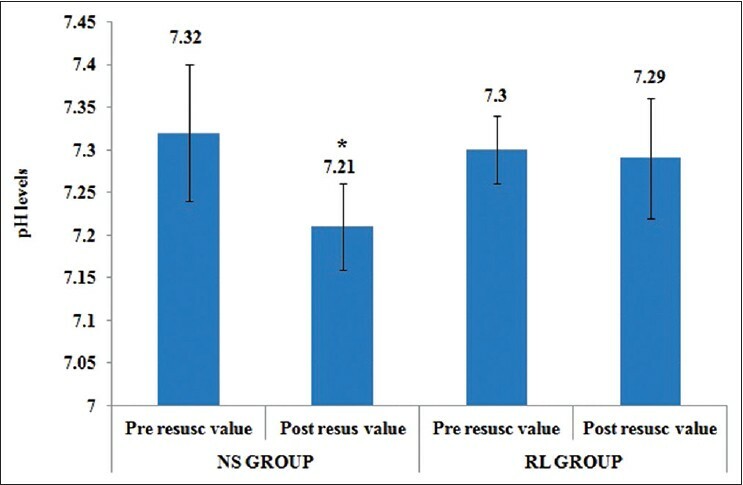 The central venous pressure and mean arterial pressure increased significantly after resuscitation with NS and RL [[P < 0.05, [Table 2]. The blood pH (7.21 ± 0.05) and standard BE (−8.09 ± 3.90 meq/l) significantly decreased (P < 0.05) in patients receiving NS. They did not decrease significantly in patients' receiving RL (7.29 ± 0.07 and − 5.41 ± 2.73, P > 0.05). The AG did not change significantly in both the groups [Table 3], [Figure 1]. The serum Na + and Cl− level increased significantly to 140.07 ± 6.36 meq/l and 119.97 ± 5.03 meq/l (P < 0.05), respectively, after resuscitation with NS. It did not increase significantly in patients receiving RL (138.92 ± 4.50 meq/l and 110.83 ± 3.50 meq/l, P > 0.05). 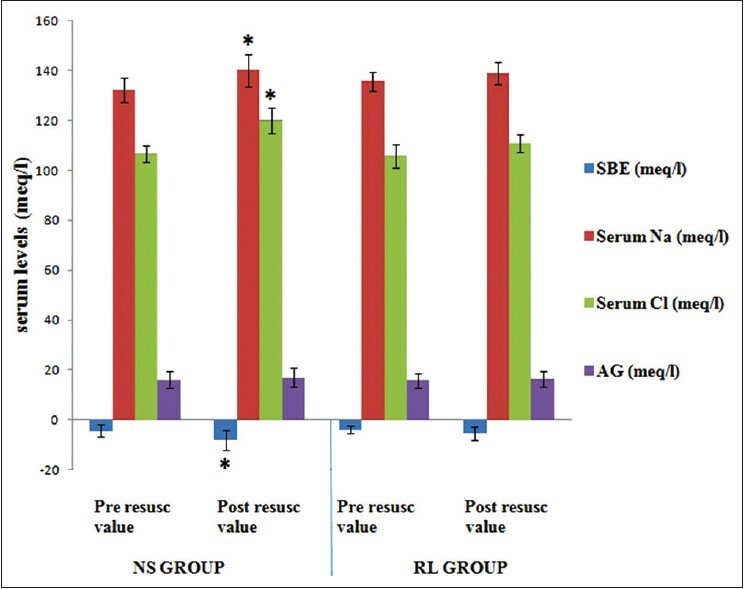 Whereas the serum albumin level significantly (P < 0.05) decreased in NS group (22.23 ± 4.55 g/l) and RL group (21.47 ± 3.71 g/l). However, the change in albumin level was not statistically significant between the groups [Table 4], [Figure 2]. The sodium chloride effect (meq/l) on BE significantly increased to − 17.90 ± 4.96 meq/l (P > 0.05) in patients receiving NS. The increase was not significant in RL group patients (−9.91 ± 5.66 meq/l, P > 0.05). The albumin effect on BE significantly increased (P < 0.05) in both NS group (4.94 ± 1.14 g/l) and RL group (5.13 ± 0.9 g/l). However, there was no significant difference in albumin effect between the groups [Table 4], [Figure 3]. The NS and the RL administration did not significantly change unmeasured ion effect on BE. However, when measured standard BE level was compared with the level of unmeasured anion (UA) effect on BE, there was a significant difference in both the NS group (−8.09 ± 3.90 vs. −4.87 ± 0.89) and RL group (−5.41 ± 2.73 vs. 0.55 ± 0.09). The level of UA effect on BE was significantly lesser than standard BE in both the groups [P < 0.05, [Table 4], [Figure 3]. Fencl and Stewart analyzed the acid-base status with the help of SID, where sodium and chloride ions were the principal contributor to the SID. Changes in sodium and chloride can be used to calculate directly the major changes in the SID. As the SID (difference between sodium and chloride) decreases the blood becomes more acidic. Prough,  in his review article, mentioned that dilutional acidosis usually is hyperchloremic because the increased chloride concentration is altered slowly, whereas other commonly infused anions are likely to be metabolized or excreted . Further, Skillette et al.,  were of the opinion that solutions like RL with multicarbon anions contains Cl− and Na + in concentrations similar to plasma and are more physiological and may be less likely to acidify plasma. Similarly, in our series when the individual values of sodium and chloride were incorporated in the simplified equation (sodium chloride effect (meq/l) on BE = [Na + ] - [Cl− ] - 38), the NaCl effect on BE was significantly decreased in NS than in RL, indicating that NS was more acidic. This was similar to the trends observed in measured pH and BE in arterial blood gas. BE caused by UAs represents the corrected BE, taking into account changes in Na + , Cl− , PCO 2 , and albumin. Theoretically, it should reflect metabolic changes better than the less complete biochemical measurements, BE or AG. 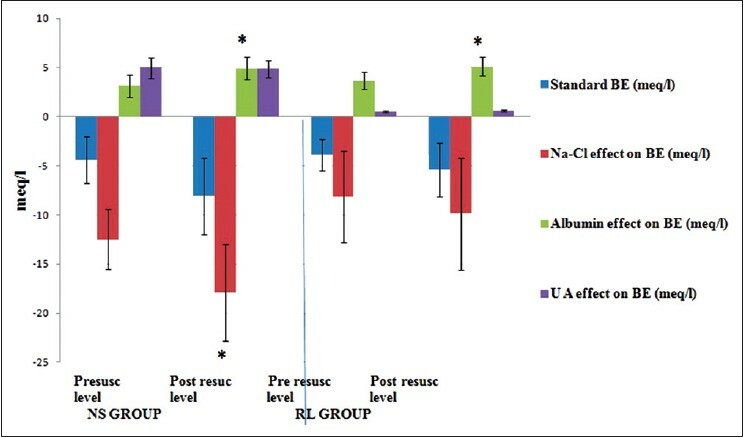 In the present study, the corrected BE (UA effect) decreased after resuscitation with fluids in both the groups. However, the corrected BE (base deficit), which was calculated using the UA effect on BE, was less as compared to the measured standard BE. This was probably because the standard BE is derived by the ABG machine using the Handerson-Hasselbach equation. Whereas the UA effect on BE (corrected BE) is calculated using the NaCl effect and the albumin effect of BE. The albumin effect on BE, which identifies the hidden metabolic alkalosis probably partially offsets the metabolic acidosis observed in the measured standard BE. Hence, there was a difference between the measured BE and the UA effect on BE (BE caused by UA = BE - (sodium chloride effect on BE + albumin effect on BE). Most of the studies are usually influenced with some degree of bias. Our study comprised of administration of two different types of fluids. Since, the types of fluids were obvious from their outer-label we could not make the study double-blind. However, we tried to make the study free from bias by designing the study in such a way that it would not have observer variability. There were no subjective parameters. All the parameters were recorded from the monitors that were of the same make. Further, the samples were coded to avoid observer bias. We, therefore, conclude that simplified Fencl-Stewart equation derived by Storey et al. is effective and easily remembered method of identifying a mixed acid-base disorder (metabolic acidosis with metabolic alkalosis), which otherwise would have remained undetected. Further, both quantitative and qualitative analysis of acid-base derangements could be possible with this method. It can be implied that the measured standard BE may not be the true projection of the clinical scenario. This approach can derive the corrected BE and guide the clinician to manage accordingly. In addition, administration of NS can lead to increased acidosis in comparison to RL. It could be detrimental in critically ill patients with existing acidosis. However, a further study may be conducted to compare the outcome of patients resuscitated with both type of fluids. 1. Stewart PA. Modern quantitative acid-base chemistry. Can J Physiol Pharmacol 1983;61:1444-61. 2. Fencl V, Leith DE. Stewart's quantitative acid-base chemistry: Applications in biology and medicine. Respir Physiol 1993;91:1-16. 3. Balasubramanyan N, Havens PL, Hoffman GM. Unmeasured anions identified by the Fencl-Stewart method predict mortality better than base excess, anion gap, and lactate in patients in the pediatric intensive care unit. Crit Care Med 1999;27:1577-81. 4. Fencl V, Jabor A, Kazda A, Figge J. Diagnosis of metabolic acid-base disturbances in critically ill patients. Am J Respir Crit Care Med 2000;162:2246-51. 6. Skellett S, Mayer A, Durward A, Tibby SM, Murdoch IA. Chasing the base deficit: Hyperchloraemic acidosis following 0.9% saline fluid resuscitation. Arch Dis Child 2000;83:514-6. 7. Waters JH, Gottlieb A, Schoenwald P, Popovich MJ, Sprung J, Nelson DR. Normal saline versus lactated Ringer's solution for intraoperative fluid management in patients undergoing abdominal aortic aneurysm repair: An outcome study. Anesth Analg 2001;93:817-22. 8. Prough DS. Physiologic acid-base and electrolyte changes in acute and chronic renal failure patients. Anesthesiol Clin North America 2000;18:809-33. 9. Scheingraber S, Rehm M, Sehmisch C, Finsterer U. Rapid saline infusion produces hyperchloremic acidosis in patients undergoing gynecologic surgery. Anesthesiology 1999;90:1265-70. 10. Waters JH, Bernstein CA. Dilutional acidosis following hetastarch or albumin in healthy volunteers. Anesthesiology 2000;93:1184-7. 11. Figge J, Rossing TH, Fencl V. The role of serum proteins in acid-base equilibria. J Lab Clin Med 1991;117:453-67. 12. Story DA, Poustie S, Bellomo R. Estimating unmeasured anions in critically ill patients: Anion-gap, base-deficit, and strong-ion-gap. Anaesthesia 2002;57:1109-14.